Have you ever yearned to be a fly on the wall in the apartment of an elderly couple? Have you ever felt cheated from the opportunity to watch as they spend their last days together? Have you ever wondered what the end of true love looks like when it dies of natural causes? Well you’re in luck! 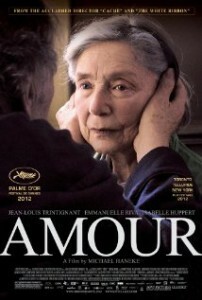 Amour affords us the unique perspective of sitting in the corner of a still and nearly lifeless Parisian flat for the end of what must have been a beautiful relationship. And for over two hours you too can experience what it’s like to watch the love of your life die a slow and painful death! “It Hurts, It Hurts” rings out as the old and helpless husband hand feeds his beloved wife as she groans in pain and stares right through him, not recognizing a single trait! Probably the most depressing, bleak and dull film I have ever witnessed. Please don’t misinterpret this as an indictment of the inventive German born writer/director Michael Haneke. His film is undoubtedly the vision that he meant to bring to the screen. But why would he want to and why would anyone want to endure the misery that is this film and finally, why does everyone feel the need to heap praise, accolades and nominations on this work of agony? His films tend to be uncomfortable and challenging to view. Funny Games is brutal, Cachè is terrifying and Benny’s Video had me on edge throughout. All of these films explore subjects I should never have to experience during my lifetime other than on screen. I doubt I will ever be the victim of a home invasion, I don’t aticipate a surveilance expert video taping my life from a far and an air compressor gun is not how I see myself going out. But the storyline of Amour is a very real and possible end to all of our lives and it’s horrific. I get the desire to explore this side of love. The unspoken, unpleasant and the inevitable end of a lifelong relationship. But unless you plan on dieing alone, there is no reason to experience this twice in a lifetime and seeing Amour on the big screen will afford you just that. Posted on Monday, January 21st, 2013 at 1:11 pm and is filed under Reviews.